Give your children and pets a cleaner, healthier place to play and relax. Denali Clean Cleaning & Restoration Services, Inc. knows that the floor is the most-used part of your home—it serves as a play area for children, a rest area for pets, and a the place where you lay your feet after a long day. However, carpets can harbor lots of dust and other unwanted contaminants. Our carpet cleaning company helps you stay on top of your floors. We offer carpet cleaning services for full home carpeting and even for areas rugs. Let our cleaners show you the difference a clean carpet can make in your home. You will notice a difference in the quality of the air, along with a difference in your loved ones' health. You should consider carpet cleaning services if you have young children, or if a member of your family struggles with asthma. Get in touch today to learn how you can save up to 15% with our first-time client discount. As the leading provider of carpet cleaning in Crystal Lake, IL, we understand your concerns when it comes to your home's flooring. You may worry about stains or damage caused by harsh cleaning solutions. 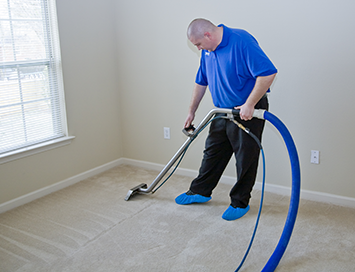 With our team on the job, you never have to worry about your carpets. Our cleaners eliminate 99% of dust and allergens nestled in your floors using heavy-duty suction equipment and deep cleaning solutions. Trust our quality carpet cleaning service with more than four decades of experience. Each of our cleaners undergoes years of training before working with clients. We handle each type of carpet we clean with the care and respect it deserves. For example, we approach oriental, wool, and Haitian cotton carpeting with custom water settings and solution types. Need Fine Rug Cleaning and Area Rug Cleaning? We offer cleaning for fine rugs, areas rugs, many different types of rugs including oriental rugs. We have state of the art rug cleaning facilites in order for carefully clean your rug. This system is gentle yet effective. We can also repair your rug including services needed like, serging, binding, patching, and reweaving. Our service allows for us to pick up your area rug, clean and/or repair your area rug and then return it. Trust us for all your area rug cleaning or area rug repair needs. in your hardwood, carpeting, or tile. Though we vacuum all carpets we clean with our carpet cleaning service, we know that isn't enough to get carpeting truly clean. Vacuuming is a great starting point, but we always follow up with a rigorous, yet controlled steam cleaning session. Whereas other cleaning methods leave behind dirt and residue, steam cleaning does not; furthermore, it gets rid of pet stains and odors. Along with carpeting, our cleaners offer services for many other flooring surfaces, including tile and wood. Reach out today to learn more about our approach to these materials, or to get additional information about our pet services and pet guarantee. Contact our team to schedule carpet cleaning for any room in your home. We proudly serve families in Crystal Lake, Algonquin, Lake in the Hills, Woodstock, and Huntley, IL. Denali Clean Cleaning & Restoration Services, Inc.